Believe it or not, I’m finally home. I didn’t quite take up residence on node 3, floor 6 south of the Pacific Campus of CPMC, though there were times it may have looked that way. I wore four bracelets for two weeks. Staying in the hospital for a relatively long time can be uncomfortable and exhausting. There’s no place like home, and the Ozian adage applies when you’re sick too. Even for someone capable of generally sleeping through noise, like I am (particularly notable feats include sleeping through my friends partying in a hotel room with music and a hospital blood draw), the hospital can make it difficult to get a full night’s sleep. While I am technically capable of sleeping through vitals checks and blood draws (especially through my handy PICC line, where I don’t even need to get poked), it becomes a much more difficult pursuit when the nurses and aides have to turn on the light, re-position me to get the correct arm (blood had to be drawn through the PICC arm and blood pressure couldn’t be taken on the PICC arm), take my vitals three times to make sure they’re really that low, etc. It could also be difficult to return to sleep after the early morning check up, including vitals and blood draws, as it would be just close enough (4:30-5:30 usually) to when I would wake up naturally to cause problems. Add in the occasional early morning admission or inconsiderate roommate (4 a. m. is not the time to watch TV on full blast or call everyone in your address book to complain about your bowels!) and sleep could feel elusive. On top of that, I was often in need of more sleep than usual because I was exhausted from various procedures and just from being sick. I did take naps, but there’s nothing like my own bed for a good night’s rest. And then there’s claustrophobia. I spent almost all of the fifteen days on the sixth floor, with a few sojourns to GI Lab (fifth floor) and radiology/nuclear medicine (second floor.) I didn’t step foot outside the entire time. Believe me when I say that the walk from the hospital entrance to the curb where my dad had the car felt fantastic. Fresh air truly is a wonderful thing. Being cooped up like that could make you go a little bit crazy. There are always the views…and there were far better ones when I went on my blood clot preventing walks around the floor! All of the inconveniences of the hospital stay pale in comparison to what I got out of it, though. When I left off in my last post, I think I’d just had my gastric emptying study. I didn’t know my exact emptying time, but I knew that it had looked and felt pretty delayed. On Monday I received news of the precise time: 54% of my simple meal remained in my stomach after four hours. Normal is considered to be under 10%. This kind of delay is indicative of pretty considerable gastroparesis. Radioactive eggs actually become yummy when you haven’t had anything to eat by mouth in weeks. Yes, I enjoyed eating the meal for the emptying study…at least until the pain and reflux started! Saturday morning, I wrote an update here, but I don’t think I said much about my cardiac issues other than to mention that my heart rate was having problems. Well, first of all, the good news: my QT interval reverts to normal when I have a good electrolyte balance and avoid even the most mildly prolonging of medications. If I take even “less prolonging” medications, my QTc (corrected interval that accounts for heart rate) gets out of whack. Basically, this means I have to be very careful about what medications I take and there are pretty much no anti-emetics (drugs for nausea) or pro-kinetics (drugs that improve motility) that I can take. That’s less of a sacrifice than it might be because none of the anti-emetics really work on me, unless I get enough of a combination that they just put me to sleep. I talked about this with a couple of my doctors and it’s because my vomiting really isn’t nausea-mediated. For a lot of people, the loop goes nausea -> vomiting -> nausea but for me it’s vomiting -> nausea -> vomiting. If I take drugs that remove nausea from the equation, I may temporarily feel more comfortable, even falsely optimistic, but that soon goes away when I begin vomiting again. I also don’t always have nausea even when I am vomiting. Weird, I know, but it helps explain the lack of efficacy! More of an ongoing dilemma has been my heart rate. I was put on telemetry (heart monitoring) and a beta blocker because of my long QT at the beginning of the first week. While on the monitor, everyone began to notice that my heart rate would spike considerably at different points through the day. Several times when I got up to go to the bathroom, for example, nurses would race in to ask what was wrong and then tell me my heart rate had gone up. “Oh,” I would say, “I guess it feels a little fast.” I figured it was going up by ten, maybe twenty at most, since I didn’t even feel lightheaded, didn’t see black, didn’t collapse — all things I’ve done in the past with orthostatic intolerance. My heart rate was reaching into the 160s and 170s when I stood up. Even with the beta blocker. Some of the telemetry that helped us figure that out. I’ve talked to no fewer than four cardiologists since that point, and everyone agrees that as long as I’m mostly asymptomatic with my tachycardia, no more beta blockers and lots of fluids. My heart rate continued to spike into the 160s or so when I stood and continue around the 140s when I stayed standing up. My resting heart rate was typically in the 80s or so during the day, often dipping into the 50s at night, so I had a lot of variation. Some of this may just be deconditioning, so everyone has encouraged me to keep standing/walking in the hope that will help with this in the future. (When I first went on telemetry, concerned nurses originally made me stay in bed. This meant I got heparin shots to prevent blood clots. I’d rather walk, for a lot of different reasons.) The electrophysiologist I saw in the hospital told me that it’s common to have issues with regulation of heart rate and blood pressure if you also have gastroparesis/motility issues because they all involve the autonomic nervous system. The only weird thing is that I’m asymptomatic, but I’ll take that kind of weirdness! So, for now, I just have postural tachycardia, rather than Postural Orthostatic Tachycardia Syndrome. My cardiology fellow brought me this guy. She was amazing, both as a doctor and a person, and felt badly about my being inpatient over the holidays. Isn’t he the cutest?! Back to the star of this show: my stomach! On Monday, I had yet another EGD (upper endoscopy), this time with a pyloric manometry. The pylorus is the valve that separates the stomach from the small bowel and allows the passage of food. Some people with gastroparesis have a pyloric spasm that contributes to their delay in emptying food from their stomachs. For those people, injecting Botox into the pylorus can help. When I went in for the procedure, my doctor said that she would inject Botox if my pylorus had that kind of problem. It turned out that it didn’t, so that ruled that option out. Also on Monday, I received a diagnosis of idiopathic gastroparesis. While some gastroparesis stems from diabetic neuropathy, and a tiny percentage comes from autoimmune disorders like scleroderma, much of it is idiopathic. That sounds crazy until you realize that, as my favorite hospitalist Dr. Cheng explained to me, much of medicine is idiopathic. We don’t know what causes most cancer or heart disease, for example, even if scientists have identified some risk factors. Through all of last week (and all of my stay, really), plans and ideas continually changed. Some of you undoubtedly saw my Facebook updates to that effect. Originally, there was some talk of my receiving a J-tube (surgical feeding tube into the small bowel) and a Gastric Electrical Stimulator (pacemaker for the stomach) in the same surgery within a few days. Then, there was talk of a temporary stimulator to do a trial since we didn’t know that the stimulator would work in my case, since my motility is so weird. Then, in part because the holidays were coming up, my doctors decided to wait to do the temporary stimulator until after the first and to have a surgical J-tube placed last week. While in my small bowel, the idea was to take a full muscle biopsy (which is only possible during surgery) to check for some weird muscular diseases since I’ve had other neuromuscular symptoms. I talked to the surgical resident who would be on the surgery with one of the minimally invasive surgeons Tuesday night and she said that the surgery would probably be Thursday or Friday since I wasn’t on the schedule for Wednesday. Then she came back later that evening and said that I was going to have surgery on Wednesday and it would be some time after 2:30. Then she came in early Wednesday morning and said that actually it would be sometime that morning. See what I mean by a roller coaster? And that pales in comparison to what’s coming. Wednesday morning, not long before I was set to head down for surgery, Dr. Cheng came in to tell me that he, Dr. Shetler, and Dr. Snape had been talking and they decided not to have a surgical j-tube placed just yet. The muscle biopsy was too risky for a shot in the dark and any time you operate on the intestines, you run the risk of creating or exacerbating a motility problem. Since they planned for me to come back in just a couple weeks for a stimulator trial, and nobody could say if I would need a feeding tube long term. And everyone thinks that it’s basically a miracle that I haven’t had abdominal surgery at this point and nobody really wants to be the first one to mess that up. You may not quite see, but I’m smiling and giving a thumbs up in the second picture. (Thumbs up rock! They basically kept me going through the stay!) I had yet another nasal tube placed at bedside, before being sent down to interventional radiology to have it advanced into my jejunum. Dr. Shetler (my main GI) came by to talk to us about the new plan right as transport arrived to take me down to IR. She said she’d come back but she talked to my parents for a few minutes as I was being wheeled away. The last thing I heard her say as I was being wheeled away was that we were running out of options and if the stimulator didn’t work, we’d be out. I got down to IR and the nurse assisting the radiologist was the same one I’d had for both my last NJ placement at CPMC and for my Upper GI. She remembered my problems with latex! 😀 I figured out that I was particularly memorable because I was basically the youngest one in the hospital (it only takes patients over 18 and 19 year olds are a notoriously healthy bunch…and still handled through children’s hospitals in a lot of cases.) Also, the tubes help. The radiologist came in and got to work. He had no trouble advancing it through the pyloric sphincter, but he started to run into problems in my duodenum, which is the first section of the small bowel. He started asking me some questions about my medical history, which I was able to answer. (The nurse was impressed by how much I remembered — a good memory can really come in handy in these kind of situations!) He told me that the first part of my duodenum was baggy and loose like my stomach and then it suddenly became normal right after the part he was having difficulty getting the tube through. He started injecting contrast, which he did several times, and he asked if I’d had an abdominal CT. When I said that I’d had one the previous week, he sent the nurse to pull it up on the computer. He got the tube into my jejunum, then went to look at it. When he came back, he asked me if I’d ever heard of SMA Syndrome. “Superior Mesenteric Artery,” I said, “I don’t know a lot about it.” I didn’t. I’d come across a few references previously, and they didn’t make it sound good. There’s no good reason for me to have even remembered what it stood for, but I did. He showed me the x-rays and explained that when he sees a young, thin girl with failure to thrive and gastroparesis-like symptoms and a baggy duodenum that suddenly gets normal, he has a pretty high suspicion of SMA syndrome. He said they see about two cases a year at CPMC, always with my kind of symptoms and body type. He said that my CT does indeed show the characteristically narrowed angle. What happens with SMA Syndrome is that the eponymous artery, which crosses over the duodenum, ends up compressing the duodenum to the point of partial or even full obstruction. Normally, there should be a pad of visceral fat protecting the duodenum, but sometimes that pad disappears. It’s controversial whether it can be a primary issue or whether it has to be secondary. While at first my doctors kicked around the idea of it being primary, nobody seems to be very convinced by that and the general thought is that some kind of motility issue caused weight loss, which caused SMA, which caused further motility issues and weight loss, which made the SMA worse….They keep emphasizing that my case is complicated for a reason! The radiologist brought in my parents and showed up the abdominal CT and explained some more about SMA Syndrome. He explained that while everyone’s concern with body habit is about people being overweight, being underweight can be even more dangerous. Losing fifteen or twenty pounds from an already thin frame just isn’t good. He showed me some maneuvers to try if I were able to eat to see if they would help allow for the passage of food through the obstruction. My mom asked him if this meant that I would be able to eat normally once the SMA is fixed and he hesitated, before saying that it would probably take some retraining. When I got back up to my room, my GI came back by. 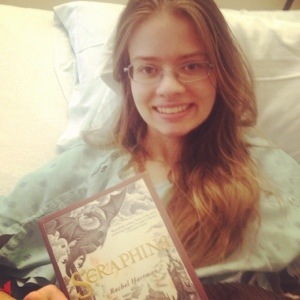 She hadn’t heard from the radiologist yet, but when I mentioned SMA, it was like a light bulb went off. She said that it could explain my symptoms. 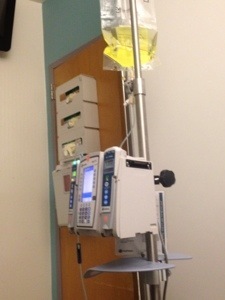 It even explains how I haven’t thrown up my NJ tube, despite some serious vomiting — the SMA pinned it in place. 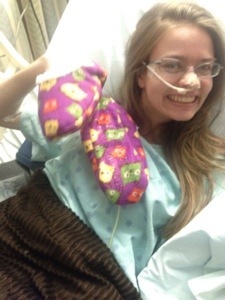 When she came back after checking the scans, and the hospitalist also reviewed them, we all came up with a plan of attack: try to put on weight with the tube feeding and see if that resolves the SMA. If it does, we’ll see how many of my symptoms remain and treat accordingly (considering the stimulator if we absolutely have to.) If it doesn’t, then the we’ll have to consider some scarier options (really major surgery, basically.) Hopefully, it won’t even begin to come to that. For a lot of people, restoring the visceral fat does the trick, and I very much hope that I’ll be one of them! This hasn’t been an easy diagnosis to receive, but we have a plan going forward and something to explain my symptoms and their severity. Over the last few days of my hospital stay, we figured out a formula that I could tolerate through my tube (fourth time’s the charm!) 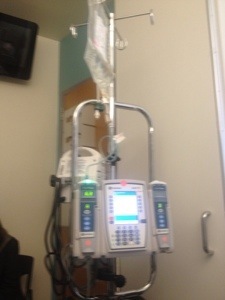 and I’ve been sent home with that and saline/potassium/dextrose infusions through my PICC line. I have a lot of really smart doctors who are thinking things through and each day we get closer to a resolution. I’m stable now and while my situation isn’t entirely tenable in the long term, we have time. My doctors have collected a lot of data and stabilizing me has given them time to go through it and think about it some more. I’ve got a PICC, so it’s all good. Saturday was a nice and distracting day. I started a better formula, took a shower, had a great visit from my friend Genny who was back in the Bay for the holidays, and got to go through a pole-free walk because my pumps were broken. And while I came into the hospital in a wheelchair, I left walking. READY FOR ANYTHING! And again, with the thumbs up! I mean it when I say ready for anything. 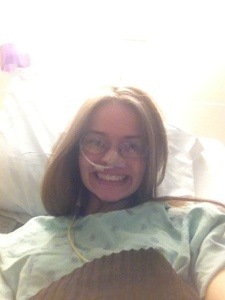 I won’t let a little SMA or gastroparesis get me down! And a new feature, started at the suggestion of my uncle: foods I’m currently craving! Chocolate (expect to see that always), chocolate fudge, French toast, Atlantic salmon, garlic bread, roasted carrots, ice water. Seven months ago to the day, I had an almost normal day. I studied hard and worked on writing the second of my two essays due that (and every week at Oxford.) I put on a pretty dress and headed to formal hall, which was a nicer dinner you were supposed to dress up for at Teddy Hall. I donned my black gown and I ate delicious food fixed by the college chef, including a dessert of milk chocolate mousse. I can still remember the way that tasted. After dinner, we did as we frequently did and headed across the street to the Grand Cafe for half priced cocktails (mock tails in my case.) There was a sizeable group of us there, crowded between the back wall and the side mirrors. We didn’t plan to stay long, as it was a Tuesday and we all had essays and problem sheets beckoning us to the library or bed. I didn’t order a drink, because I was feeling nauseated. Maybe I was tired or the milk and chocolate of dessert didn’t quite agree with me. I walked home to the nearest reaches of Cowley with my friends. When I got back to my room, I threw up my dinner. That was the last night I ate normally. That was the last night I didn’t eat according to some kind of regimen in an attempt to keep what I ate down. That was the last time that I ate without the prospect of throwing up. Seven months later, I’m not throwing up three course meals, I’m throwing a few teaspoons of chicken broth. 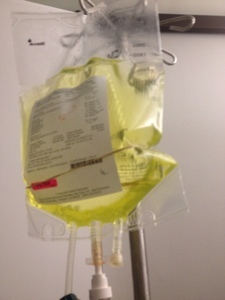 I keep trying the clear liquids I’m given here – I will never,ever give up and never stop trying – but I’m 99+% dependent on the TPN and saline I get through a jumped up IV. 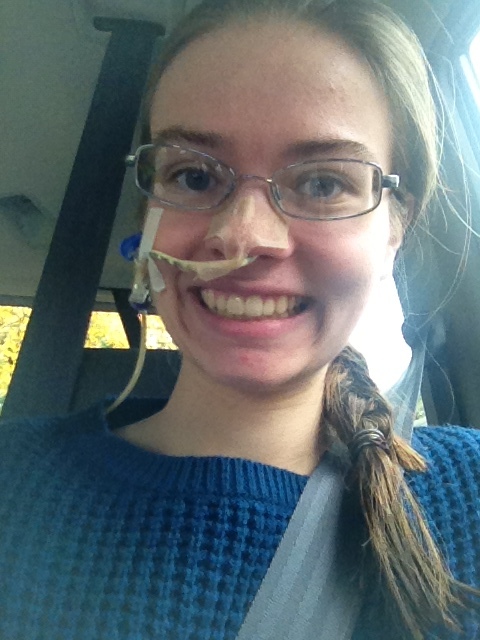 Seven months ago, I’d never heard of the gastric electrical stimulator and I’d barely heard of gastroparesis. Now, I’m facing imminent surgery to implant a stimulator to treat hopefully my newly officially diagnosed gastroparesis. Seven months ago I never could have imagined any of this. Hey CPMC, I just met you, so this is crazy, but — wait, it’s been seven days?!?!?! Lots of things have come back normal. Lots of things have come back a bit off, but not nearly enough to explain what’s been going on. Everyone acknowledges that I’m a really challenging, unique case. Lots of good heads are coming together. Dr Shetler and my awesome hospitalist Dr Cheng have been the driving forces, while working closely with a cardiologist who specializes in rhythm issues. Because this is a teaching hospital, there are lots of fellows, residents, and interns, which is great because sometimes they come up with fresh ideas and provide another set of eyes and ears that are able to spend lots of time with inpatients. So back on Thursday, I found out that while my capsule endoscopy didn’t show any structural abnormalities, the pill did get stuck at my lower esophageal sphincter for twelve minutes!!! That’s a lot! So they did an esophageal manometry — easiest test ever, just an NG tube placement and little swallows and my nurse said I should come back and tell all her patients that — to look at those muscles. The doctors started talking about a Botox injection into the lower sphincter to help let food through. This procedure carried the prospect that I might leave in a few days eating and drinking!!! Needless to say, I was very excited. Unfortunately, that evening I found out that because my manometry was normal, I needed another test and probably couldn’t get the Botox. All I — and my doctors and my parents — can say isTHANK GOD!!! Yesterday morning I swallowed Barium (and started throwing it up under fluoroscopy) and pretty quickly the radiologist told me something was really wrong. To start, my stomach just didn’t look right. It was large and floppy and dilated and looked really old. My docs have never seen anything like it. And then my esophagus and stomach weren’t moving things through well. In the words of the radiologist: there’s something really wrong; you’re not making this up. Thanks doc! They went ahead and got me into a gastric emptying study hat afternoon…no numbers yet but it looked pretty severely delayed. And I was refluxing undigested eggs after four hours so…. ETA: if I’d gotten Botox with these issues, everything that wasn’t emptying out of my stomach would have just come flying up and I would have been even sicker. Monday everyone is going to meet to try to figure out what to do with me. We don’t know what causes this and I can’t take any medications for it, so I may well be looking at surgery. I’ll be here until at least Wednesday. We’re also still trying to get my heart rate under control and having issues there, so I’m still on telemetry. Because of the monitoring I need I’m on the liver and kidney transplant ward…apparently I’m between the kidney and liver patients in terms of difficulty for the nurses medically but my smile makes up for it. I so grateful to be in the right place and getting more and more answers. We will get there one day soon!!!! I have the weekend “off” from testing, which is nice because I’m exhausted. Monday we’ll all hit things hard again. We are getting there! Next year I’ll eat latkes and applesauce!!! Hi everybody! I’m here in the hospital and have been since Sunday. I don’t know when I’m leaving – I think it depends on how some of my test results come in. 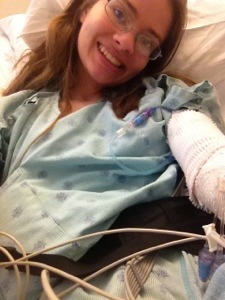 We also have to figure out how I’ll get nutrition, because right now I’m on TPN through a PICC line. TPN = total party now? Actually total parenteral nutrition where I get fed through my bloodstream. I’ve had lots of tests and have a few more coming. By the end of today I’ll have been scoped three times in four days, plus a capsule, CT, X-rays, much bloodwork, PICC insertion, all the preps, a couple manometries….hopefully it all gives us some better answers! Also lots of cardiac monitoring. I’m on my phone so it is hard to type so I’ll just leave plenty of pictures! So much for regular updates…. I don’t have a “too busy” excuse (obviously), just a not quite feeling up to it one. 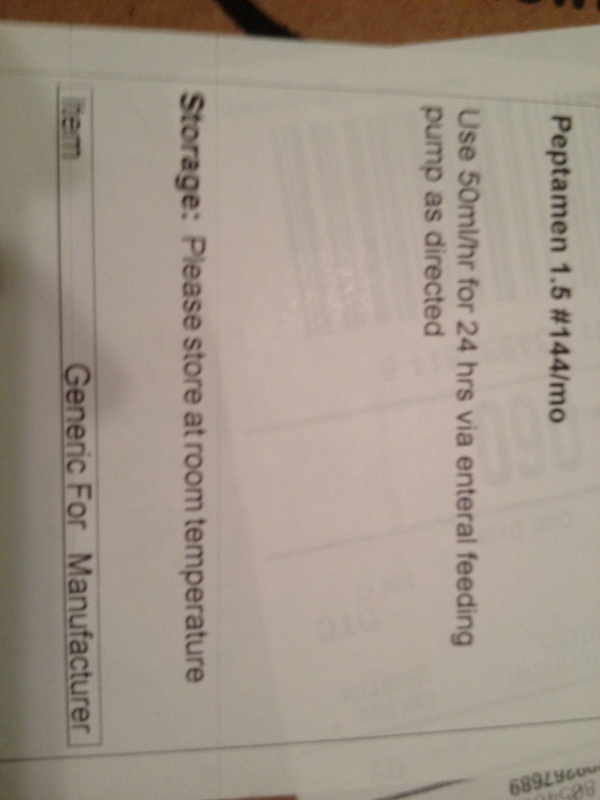 Unfortunately, the switch to Peptamen wasn’t quite the miracle cure I hoped for. There are definitely some improvements — less gas, a less obnoxious smell of the formula itself, I’m able to get more calories in. (And they should be more easily absorbed.) All good stuff, don’t get me wrong. But the big ones — abdominal pain and discomfort, diarrhea, and nausea — are still around and at this point, they seem to be more symptoms of whatever I have going on rather than side effects of the treatment. On Friday and Saturday, while things weren’t perfect, I actually thought that the Peptamen was beginning to make a difference. On Sunday, I quickly realized that wasn’t the case. Without going into too too much information, let’s just say that my body pretty much decided to put itself through a couple of colonoscopy preps. It’s a lot of fun Googling your symptoms and having the only thing that comes up be Cholera. (Note: I don’t have Cholera. I live in California, thank you very much. And the volume was only bad by normal standards; it didn’t reach Choleric heights, only appearance.) For a while I couldn’t even rehydrate through my tube without it being counter productive. I also had a lot of pain and when I touched my abdomen in certain places, I could feel things moving beneath my skin. I made it through an echocardiogram on Monday! My cardiologist in San Francisco wanted one done but said that I could have it done locally so that I didn’t have to make a long drive for a relatively simple test. The pain made it almost impossible to sleep on Monday night (I was up every hour) and feeding left me in enough agony that I turned the pump off for several hours on Tuesday, although the diarrhea had abated. After much dithering (not helped by being strung out from pain and exhaustion), I went ahead and called my doctors. I left a message for my gastroenterologist on her nurse’s voicemail asking what I should do if this recurred. I felt badly about calling, because I worried that it was too insignificant of an issue to be hassling the doctor about, but I went ahead and left the message anyway. Every five seconds. For forty-five minutes. At which point I turned it off, because I’d only gotten 2 milliliters of formula. (I was running it at 40 mls/hour.) My mom called Walgreens Infusion the company sent out a replacement. Paul delivered the pump that afternoon (he and I are becoming great friends.) It looks exactly the same and is also called Joey. I was still in some pain, though not as bad, and having diarrhea when I got a call late Wednesday afternoon. Dr. Shetler had gotten the message from her nurse and was calling me back. She asked how I was doing and was particularly alarmed by the way that water seemed to make my diarrhea worse rather than better (which I guess makes it less likely that it’s a complication of the tube feeding.) She was pretty concerned about the developments and said that she had been reviewing my file. She said that I never seemed to have had a work up for Crohn’s disease and asked if that were right and if I’d ever had a colonoscopy or swallowed a giant pill camera. I told her I hadn’t. It seems we skipped straight to the motility testing and while I do have a motility problem (tachygastria), Dr. Shetler said she didn’t think that it explained the severity of my symptoms. It’s kind of ironic, because I’m on a couple of support groups for motility issues (I just joined The Gutsy Teen Lounge and it’s fabulous) and everyone seems to go through months or even years of testing for things like Crohn’s before their doctors even think of things like Gastroparesis or Cyclic Vomiting or Chronic Pseudo-Obstruction. There’s a really high level of awareness of these kinds of issues in this area, which is great, but it means that it may turn out that we jumped into that area too soon. I’m not sure that I think Crohn’s is all that likely — I don’t have a fever or anything and while some of my ethnic background predisposes me I don’t have any direct family history of it — but I think it’s a really good thing to check out. And just intuitively, it makes some sense that the issues with my stomach could be a self defense mechanism on the part of my body (trying to shield my intestines from things they don’t like.) I do know a number of people with Crohn’s, and even more who have a relative with it, so if by some chance I have it, I’d have lots of people to ask questions! Then we talked about how to do the work up for Crohn’s and everything else I need. Dr. Shetler said that I need a surgically placed J-tube (that’s a tube that goes straight through the skin of my abdomen into my small bowel, rather than going through my nose like my current one.) I’ve already had nasal tubes for some time now and they’re really not good for you or sustainable long term. I’ve also been told that once you get beyond the recovery period from the surgery, the J-tube actually ends up being more comfortable. I’d like that! Cassandra (my current and third NJ tube) may be gone soon! The long and short of it is that Dr. Shetler doesn’t think I can safely do all of this as an outpatient. Prepping for a colonoscopy isn’t easy on the body at the best of times, but with mine it could be particularly damaging. Trying to do all these tests and procedures over the next month as an outpatient could well result in my losing another ten pounds, which I can’t even remotely afford to lose off of my already too low weight. Add in how complicated it is to arrange all of these when I don’t live in the area and my needs for follow ups with my neurologist and cardiologist and it all means that I’m going to need to be admitted to deal with all of this. I’m just not stable enough to continue otherwise. I’m waiting for a call right now to work out the last of the details, but I’m probably going in Sunday morning. It was originally supposed to be last night, but we convinced Dr. Shetler and her scheduler to wait a few days so that I can go to an important family event on Saturday. I’m not sure how long I’m going to be in — nobody’s given me any details about that yet — but given how much I have to have done, I presume it’s going to be at least four nights and it could well be more, depending on how things are scheduled and how much time is needed between procedures. It could be through the end of the week. A huge HAPPY BIRTHDAY to my amazing friend Dorothy!!!! Wish I could celebrate it with you girl!! 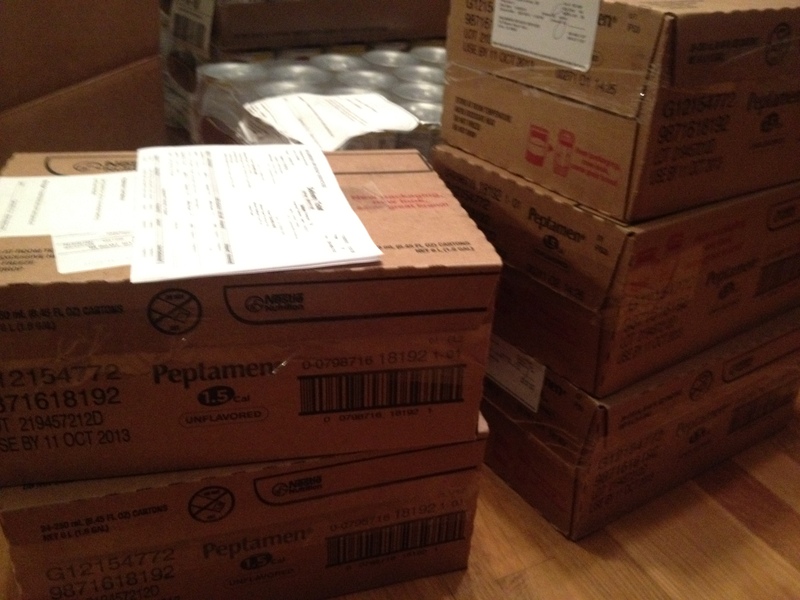 It’s all about the Peptamens, baby! Get jealous, people! 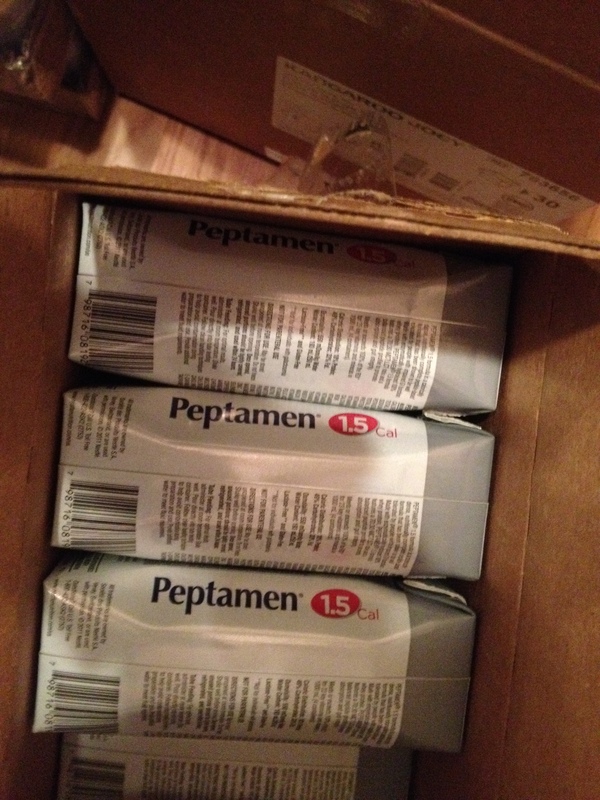 I have a great supply of Peptamen 1.5! I’m actually not being facetious at all. I started bouncing around when I got a call this morning saying that insurance had stopped dragging its feet through bureaucracy and had approved my new formula. 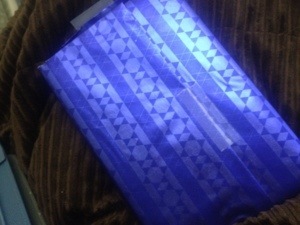 (It helped that I was on my morning “break,” where I flush my tube, wash out the night’s bag, and shower.) Peptamen is the formula that my doctors think I’ll tolerate better than my old Jevity, because Peptamen is “semi-elemental.” That means that the ingredients in it are already broken down. It’s therefore less likely to cause pain, nausea, vomiting, gas, diarrhea, cramping, etc. Sounds like a good improvement, right? I’m thrilled and incredibly grateful for this change. The last couple of days weren’t great, stomach-wise. I didn’t keep much down by mouth (after doing a bit better over the weekend) and had a fair amount of pain. It didn’t help that we went back down to SF for a cardiologist appointment on Monday (more on that later! I’m trying to space out the big, crazy, “this should be an episode of House” medical stuff with more daily life kinds of things) and those trips are always exhausting. Also the whole waking up in the middle of the night thing. Also the fact that my dear Joey pump, which has been doing a great job of not beeping at me in the middle of the night, has started doing so about an hour before I was intending to wake up. After many, many inconclusive tests, I found out the results of my electrogastrogram on Tuesday. Apparently, my stomach muscles contract too strongly and violently 25% of the time before I eat and 50% of the time after. This results in the nerves and muscles only being able to work together 9-12% of the time, which is “extremely low” in the words of my doctor. I’m still beginning to understand exactly what this all means, and I have a lot of questions to ask my doctor the next time I see her, but it basically amounts to my having a gastric dysrhythmia. You know how you can have a cardiac dysrhythmia, where your heart beats in an irregular pattern? It seems as though my stomach “beats” in an irregular pattern. Heading down and excited to get answers! The big question, of course, is how to treat this. 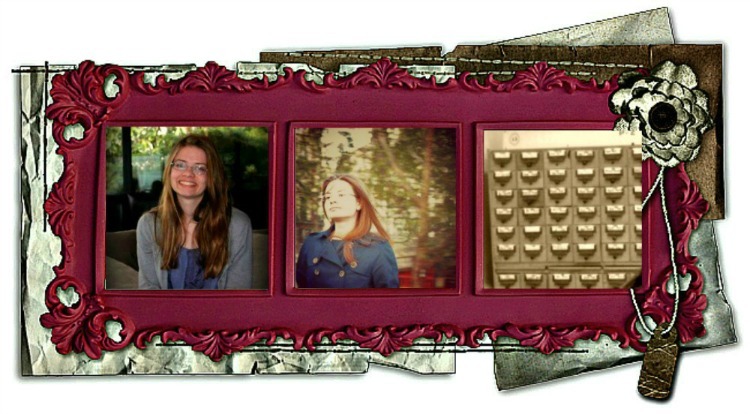 There are some medications to try that calm and reorganize the nerves. They also help with the pain and discomfort — despite the results of my Barostat, the EGG did show some visceral hypersensitivity. (I’m not sure if this is because I have it intermittently or if it’s because the overactive nerves are in my small intestine instead of stomach or…?) The only problem is that most of these drugs have cardiac side effects…including QT prolongation. My EKG showed a prolonged QT interval, which may have just been the result of some of the meds I was on. But it may also have been why I often got a funny feeling in my chest after getting IV Zofran (previously chalked up to the medicine taking its effect or the impact of rehydration, etc. since I don’t exactly look like a cardiac patient), why my heart monitor went crazy moments before I started vomiting after my last endoscopy/Barostat, why I had palpitations from a non-QT prolonging med with cardiac side effects….When I told Dr. Shetler about my reaction to the medicine B. at the beginning of my appointment, she immediately excused herself to call a cardiologist friend for a consult. The cardiologist said she would need to see me before determining whether I can take any of those medications. If not, there’s another medication we can try — it’s one originally developed for seizures — but we may need to get neuro clearance for that one. There’s also a chance that my stomach will reset and go back to normal on its own at some point. It might just need more time. We don’t know what caused the tachygastria, but a viral cause seems pretty reasonable. (It’s not exactly rare for viral gastroenteritis to cause things like gastroparesis, for example.) Dr. Shetler said it might be six months or a year if this happens, though. We’ll definitely be trying things in the meanwhile! If nothing else works, this condition does qualify me for placement of the Gastric Electrical Stimulator. It’s basically a pacemaker for the stomach, to replace/aid the stomach’s own natural one. Placing it is a major, and not uncomplicated, surgery, though, and it leaves a device in you permanently. Dr. Shetler said that while Cal Pacific is one of the places that has pioneered the use of this device and has done a relatively large number of these procedures (170 in the last 10 years), they don’t like to place them in younger patients. It’s a worst case scenario, but it’s nice to know that the possibility exists if it becomes absolutely necessary. (There’s also the possibility of a temporary stimulator, which my doctor thinks I would be a good candidate for if it came to that. In that case, they place the stimulator endoscopically and keep you in the hospital for a week or two to see how it’s working. BUT in addition to telling you how a permanent one would work, just that short placement can reset your stomach’s electrical currents for months, years, or even forever! That would require getting insurance and NIH approval, though, so not sure how likely…. I’m incredibly grateful to finally have some answers, to finally have a test that reflected how sick I am. I really don’t want to be ungrateful, but there’s a certain point at which negative test results aren’t quite good news. It would have been easier to treat H Pylori ulcers or celiac or SIBO than to remain in mystery diagnosis land. Granted, there are things I think about how lucky I am not to have literally every day — cancer is the big one. But the uncertainty has been baffling. My doctors have been cognizant of how ill I’ve been and haven’t questioned it — malingerers don’t throw up through cocktails of IV anti-emetics or lose weight despite tube feedings — but it’s still nice to see data. And it’s an incredible relief to have some direction to go in, to have a PLAN. It may take a while yet, but I’m going to get better and have a long and healthy and productive life. The worst case scenarios with all of this may include some not-so-brilliant effects, but they don’t preclude that, which is the most important thing. Also, my increased stomach pain/cramping/diarrhea are probably from not tolerating the tube feeding very well. Jevity is one of the more difficult to handle formulas, apparently. I’m supposed to be switching to Peptamen. Of course, despite getting all the calls in last Wednesday and getting orders from my pcp and all that, I still haven’t switched. Insurance has to approve it, which can take up to five working days, and there was the holiday….I understand that everyone needs holidays and vacations and weekends and whatnot, but I find it kind of frustrating that this delays getting my formula when it’s my only consistent source of nutrition. Anyway, I’ve still been getting Jevity, but hopefully we’ll get a call from the infusion company later today and I’ll be able to switch to Peptamen tonight! I also saw the neuromuscuar specialist for several hours before that appointment (probably some kind of periodic paralysis, but nothing too troubling), ended up in the ER with a clogged tube that had to be replaced, and had a cardiology appointment (this EKG was good but I’m going to have another test and monitoring if I start the meds.) For the sake of getting this post up some time this century, I’ll try to write about those later.